This was a birthday gift from Melissa Ellis. I LOVE it!! Melissa is our Inky Angels Leader and she is one of the girls in my bi-weekly group. She used an old CD case and made this cut calendar. Who can't use a calendar?!! Thanks Melissa! I'm gonna miss stamping with all those girls when I move to TX. 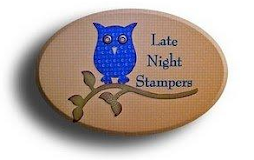 I will need to find me some stamping friends in the Austin area.